I’ve posted here before about why measuring belief in conspiracy theories can be tricky. Recently I was invited to visit University of Cambridge’s Conspiracy and Democracy project and the issue of measuring belief came up again, particularly the question of what it means when somebody indicates on a survey that they “believe” (or don’t “believe”) a conspiracist claim. I wrote a blog post for the Conspiracy and Democracy project about the idea, which I’m reposting in full below. You can also watch the full public talk I gave at Cambridge at the bottom of this post. It is also an issue which highlights the need for an interdisciplinary approach to conspiracy theories. In particular, history and political science–two of the major approaches of the Conspiracy and Democracy project–can be particularly valuable. This entry was posted in Events, Personality and tagged beliefs, conspiracy theories, measurement, personality, politics, psychology. Bookmark the permalink. 3 Responses to Are You Serious? – what do you define a conspiracy theory as? – Is there a specific group of people who are more susceptible in believing these theories than others? 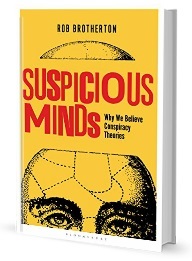 – What makes rational people buy into conspiracy theories? – Why do you think there are so many conspiracy theories based around politics/government? If possible, it would be preferable to respond by 6/6. Thanks so much. Did you ever get an answer Darcy? Not all conspiracies are fake, some are real, and some hold a drop of truth.